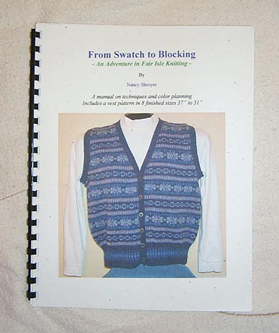 "This manual and pattern developed from a class on Fair Isle knitting that I teach. If you are a beginner in color work, this is a good pattern to start with. The long text may at first seem daunting, but it breaks down all of the steps into detailed instructions. This booklet contains more explanations and descriptions of techniques and methods than a standard pattern. I designed this particular vest pattern because I could incorporate a number of techniques in a project that could be completed in a relatively short time. I purposely made it a cardigan so you would have to learn button bands and button holes. With front bands and armhole bands you will learn a special technique I have developed for covering the cut steek stitches. And with 4 steeks, you will have plenty of opportunities to get over any fear you may have for cutting your knitting. When you have completed this lesson/pattern you will have the skills to knit any two-color knitting pattern. The vest on the cover of the manual was the original blue/violet one that I made. This pattern does not have specific colors in the design. That way you can pick from the many color ways that have been developed or pick your own. You can make the vest a few times, and it will never look the same way. Please look at our sample swatches from this pattern. We sell the all of the yarn to make vests based on the swatches in kits. When you purchase a kit, this book is included. Click here to see the sample swatches. Fair Isle knitting is a great adventure. Watching the pattern build with each row of subsequent colors is addictive – you will always want to finish “just one more row.” It is my favorite type of knitting and I hope it will become yours, too."